Amines will react with alkyl halides to give ammonium salts. This reaction is known as Amine (N-)Alkylation. Amines are generally sufficiently nucleophilic to undergo direct alkylation, often under mild conditions. The reactions are difficult to control because the reaction product is often more nucleophilic than the precursor and will, therefore, react with more alkyl halide. 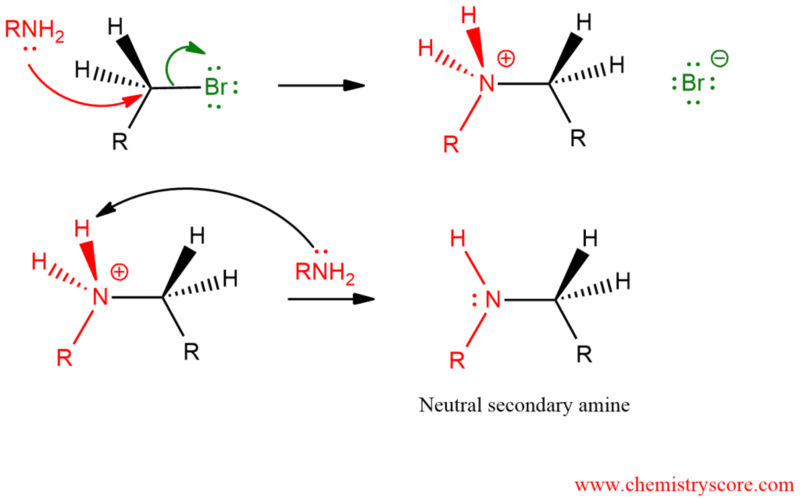 And this is the reason why this reaction occurs even if only one equivalent of the alkyl halide and amine are used. The N in amines functions as the nucleophile and attacks the electrophilic C of the alkyl halide displacing the bromide and creating the new C-N bond. The excess amine (base) deprotonates the positive N (ammonium) center creating the alkylation product, here a secondary amine. In the same way, a tertiary and quaternary amine will be obtained.